Santa Chair, photo by LadyDragonflyCC -See through my eyes!. 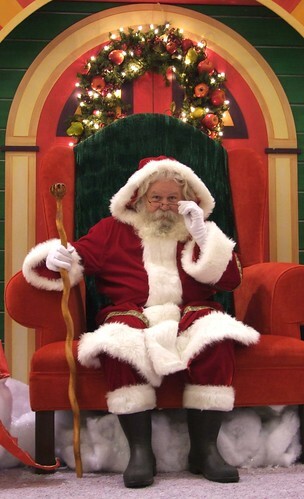 Howard, the school founder, was a Santa with an impressive resume that included being St. Nick for Macy’s. He opened the school in 1937 after coming across too many other Santas with frayed beards, shoddy suits and limited knowledge of reindeer. (current director Tom) Valent took over the school in 1986 and retains most of Howard’s original curriculum, along with modern additions such as contract issues and how to endure the rigors of being a mall Santa (get a flu shot and negotiate regular bathroom breaks). …Valent’s cheerful demeanor belies the seriousness with which he approaches his mission of ensuring that Santa Claus embodies perfection, from fresh breath and clean whiskers to impeccable morals. He’s not here to get these Santas jobs — the school has no placement services. He’s here to make sure that whether they play Santa in malls or parades, or in hospitals, homeless shelters or private parties, they do it flawlessly. Be sure to check out their photo gallery on Facebook, and if you’re interested, the 2012 Santa School takes place October 18th – 20th and is taking reservations now. Speaking of Santa, yesterday on Absolute Michigan we had an in-depth feature on including charities in your holiday gift plans that might give you chance to share some of that Santa spirit. Check this out on black and in Christine’s My Favs slideshow.